Overburdened with air pollution, East Oakland residents and activists thought they had blocked a crematorium from opening in 2012. But it quietly began operations a few months ago. Angela Scott and Esther Goolsby of CBE fought against the crematorium. When East Oakland residents learned in 2011 that the Neptune Society had a permit to build a large crematorium near 98th Avenue and Interstate 880, many of them participated in a campaign to stop it. They were concerned about the pollution it would add to their already dirty air. "It felt like a slap in the face," recalled lifelong East Oakland resident Angela Scott, who now works with Communities for a Better Environment (CBE). "They knew they could do it because they know the makeup of this area," Scott added. "People of color live here and work here. East Oakland is a dumping ground. Folks come from other areas and literally dump things on the sidewalk. And they dump their industries on us." For a while, it seemed as if the campaign to stop the crematorium had succeeded. In May 2012, the city council passed an ordinance restricting crematorium development. But a few months ago, the crematorium quietly opened and began operating. The facility got a greenlight last fall when an Alameda County Superior Court judge ruled that the 2012 ordinance did not apply to the East Oakland project because the Neptune Society already had a city permit before the council passed its law. To be fully compliant with state regulations, the crematorium still needs a permit from the Bay Area Air Quality Management District. (It got a temporary permit in August when it started operating). And despite a last-ditch campaign by CBE and other community members — writing hundreds of letters and lobbying air district board members — the district will likely grant that permit in the next few weeks. "The crematorium will last forever as an example of environmental racism," said Nehanda Imara of East Oakland Building Healthy Communities. But both East Oakland community organizations and air district officials say they are launching programs that will build the community's power to defend itself against toxic threats in the future. Air district board and staff members expressed concern about the crematorium during their Nov. 1 board meeting. Air district board member Rebecca Kaplan, an Oakland councilmember, had requested the board discussion of what would otherwise have been a routine permit application. She said after the meeting that she wanted the issue to come to the board because she was concerned about the "disproportionate impact, not only from the crematorium but from a whole accumulation of many, many sources of pollution that are concentrated in particular communities, especially in East and West Oakland." Air district Executive Director Jack Broadbent said district staffers have been getting complaints from the community about the crematorium and "have been out there taking measurements and testing the stuff that comes out of the smokestack." Although others in the meeting, including Broadbent, echoed Kaplan's concern about the high pollution levels in East Oakland and other communities, the permitting process itself does not consider this issue. It simply looks at the concentrations of chemicals produced by the facility and their likely health impacts. The problem is that "emissions from the crematorium alone don't drastically impact air quality, but they add to pollution from trucks, the airport, and other sources," said CBE regional program coordinator Ernesto Arevalo. Pollution from the crematorium, he added, "overburdens an already overburdened community." In a recent community meeting, CBE staff members pointed to a new report by the Environmental Defense Fund, which mounted air pollution monitors on Google street-view cars circulating through West and East Oakland for a year. The EDF reports that the monitors showed high levels of toxic pollution including black carbon, nitrous oxide, and nitrogen dioxide in the area of East Oakland where the crematorium operates. "[East Oakland] is suffering from some of the highest health risks for toxic air contaminants, and is in the top 5 percent of zip codes statewide that are disproportionately burdened by multiple sources of pollution," said Alameda County Public Health Director Muntu Davis in a statement. East Oakland has more than double the average rate of asthma for the county and has higher death rates for heart disease, stroke, and lung cancer, Davis added. In addition to the health threats, some Asian Americans said the location of the crematorium is culturally insensitive. "We have a different religion," said Eleanor Huang-Wilson, who owns a business across the street from the crematorium. She said that according to traditions in Japan and her native Taiwan, facilities dealing with dead bodies should be located far from where people live and work. She said that after the crematorium started operating, "I lost four workers" — Asian Americans who didn't want to work near a place of death. Although the crematorium is in an area zoned for light industrial use, Broadbent acknowledged that, "unfortunately, there are people living a third of a mile away." In addition, Scott of CBE said that when she explored the area, she discovered "there are people living in cars all around this street. They're part of the community here, too. The way we look at community is different now." Neighbors also expressed anger at the "hush-hush" way the crematorium development was planned, said the manager of a nearby business who did not want to give his name. Before local residents and businesses knew it was happening, the Neptune Society had already obtained a city permit to develop a business with the "general manufacturing" designation the area is zoned for. The business manager said the previous owners of the property now inhabited by the crematorium did not disclose who bought it. He said the owner of his business found out from her real estate agent, who called to see if the development of a crematorium might motivate her to sell. "The permit was given with no opportunity for the community to have a voice," said Arevalo of CBE. Officials with Service Corporation International, which now owns the Neptune Society of Northern California, did not return requests for comment for this report. 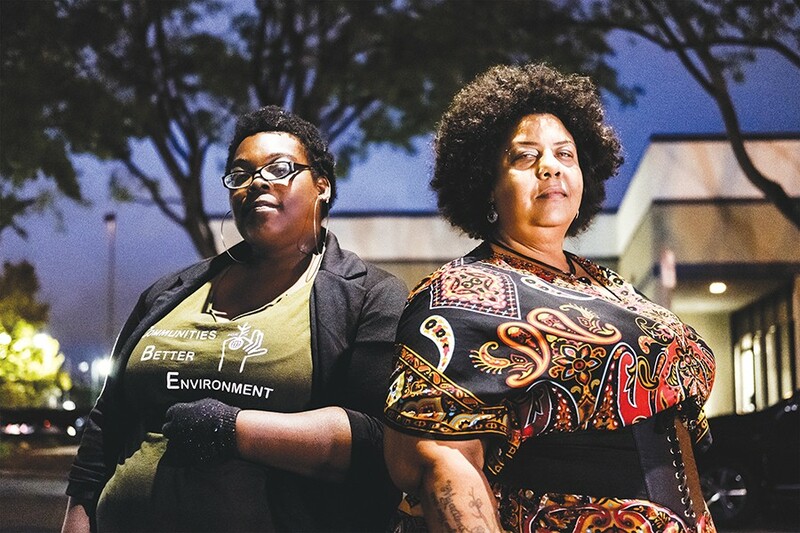 Frustration over the crematorium was one factor that led East Oaklanders to organize for more power over environmental health and other issues. On Nov. 7, the newly formed Congress of East Oakland Neighborhoods, an alliance of six community organizations, released an agenda covering issues including development, jobs, community safety, housing, the environment, and "holding elected leaders accountable." The goal, they said, is "to create power for Oakland residents so that their voice is heard on issues surrounding their communities." Esther Goolsby of CBE said that after the initial campaign against the crematorium, East Oaklanders realized they needed to take a more proactive approach to making sure that future developments fit with the needs of residents. She added that "the crematorium campaign is one of the reasons we started working on the Healthy Development Guidelines." A group of East Oakland organizations including CBE and East Oakland Building Healthy Communities have been working with the Alameda County Public Health Department and the Oakland Planning Department to create a set of "Healthy Development Guidelines" to "ensure that decisions made about development take into account access to healthy food, affordable housing, clean air, safe places to play, arts and culture, and good jobs and environments for all communities." For its part, the air district is planning to develop a program to help vulnerable communities reduce the "cumulative impacts" of pollution, Broadbent said. Assembly Bill 617, which Gov. Jerry Brown signed into law in July, mandates uniform statewide monitoring of toxic air pollution and the development of a statewide plan to reduce pollution "in communities affected by a high cumulative exposure burden," according to the legislative summary of the bill.